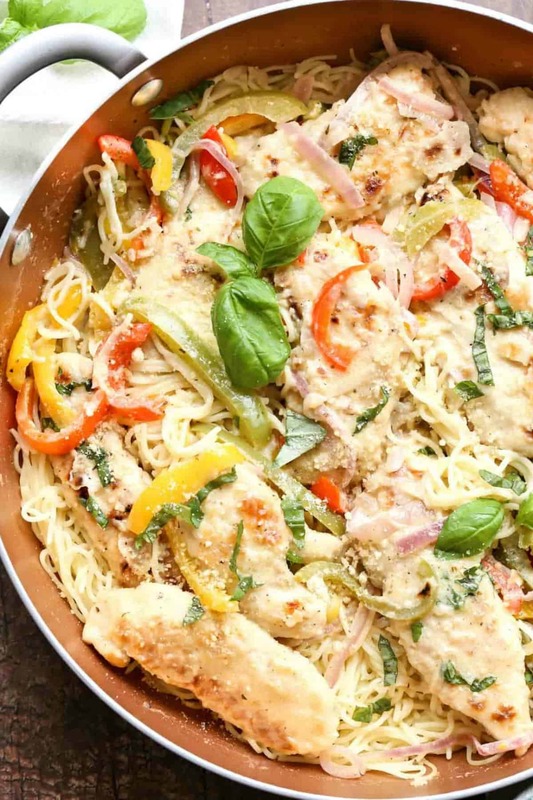 This amazing copycat Olive Garden’s Chicken Scampi Recipe is going to become your new favorite dinner saving your family money. 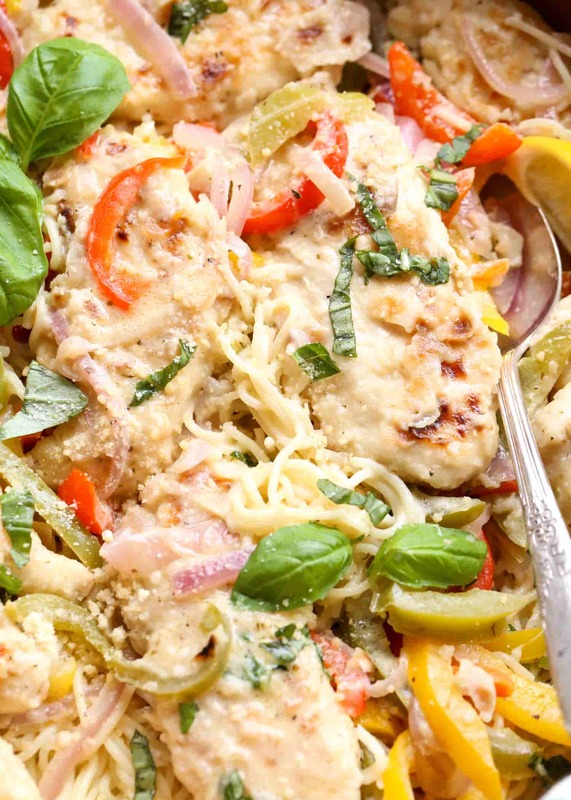 Juicy chicken with vegetables in a creamy wine scampi sauce. The Italian inspired dish comes together in 30 minutes! Our Chicken Parmesan and the Shrimp and Eggplant recipes are just are popular! So when we go out to Olive Garden to eat, one of us always orders their Chicken Scampi. It the perfect combination of flavors. 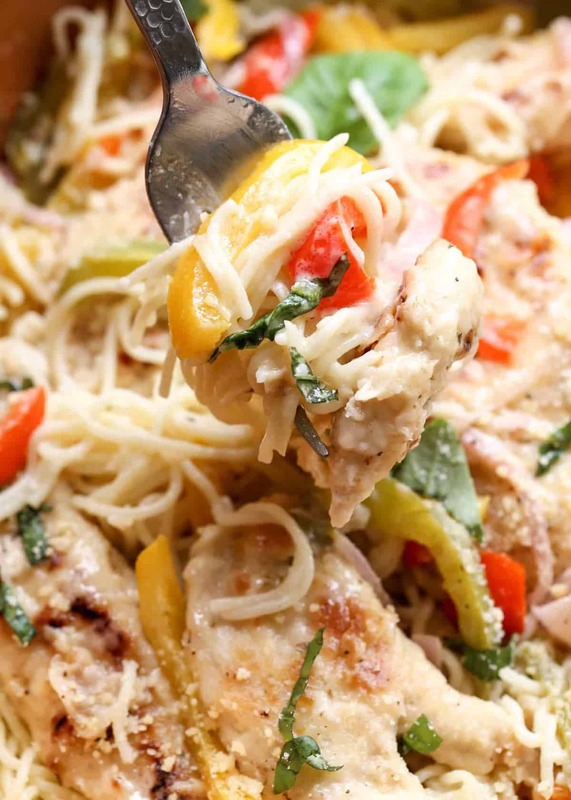 Breaded chicken breast with thin angel hair pasta and vegetables in a delicious creamy wine scampi garlic sauce. Every bite is a treat. There are usually no leftovers. The biggest drawback of going there and eating there like… once a week is the pricing. It’s almost $18 dollars. That’s kind of nuts. With this copycat recipe, I present to you today, you can feed your whole family for the price of one! Yes, please. Cook angel pasta, al dente, according to package instructions. Dredge chicken in flour and saute until crispy. Add butter and garlic to the vegetables. Add wine and broth. Add half and half. Add the chicken and pasta to the scampi sauce and vegetable. You want to use a dry wine. Sauvignon Blanc, Pinot Grigio, Pinot Blanc or Chardonnay are all great choices (I used Chardonnay in this recipe). You don’t have to purchase an expensive bottle for cooking. Mine was like $7.00 and it works great. How to make the sauce creamier? For a creamier sauce, add heavy whipping cream instead of half and half to the sauce! Quick dinners are my favorite kind of dinners. Dinners that can be made in a one-pot or all in one skillet are the best! Fewer dishes to wash means more time with your loved ones! Me like. Me like very much. P.S. If you are looking for a new skillet to purchase. I just got this SKILLET and am in love with it. It’s really deep and keeps food from splashing and is non-stick. What’s your favorite go-to meal when you go out for dinner? I’d love to do some more copycat recipes. Let me know in the comments below. I LOVE hearing from you all. Pasta & Meat in Skillet– Kid approved. Chicken and Potatoes & Vegetables– The perfect dinner, no salad needed. Vegetable Chicken Stroganoff– Regularly on our dinner menu. 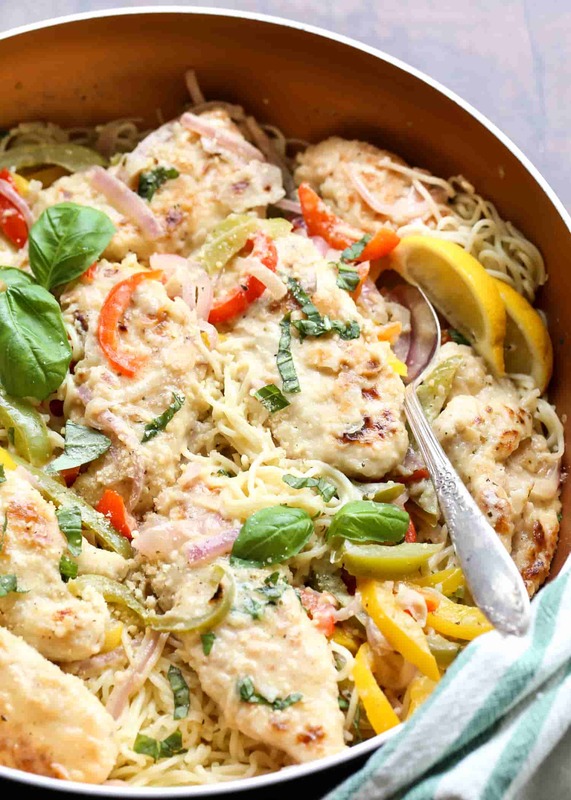 This amazing copycat Olive Garden's Chicken Scampi Recipe is going to become your new favorite dinner saving your family money. 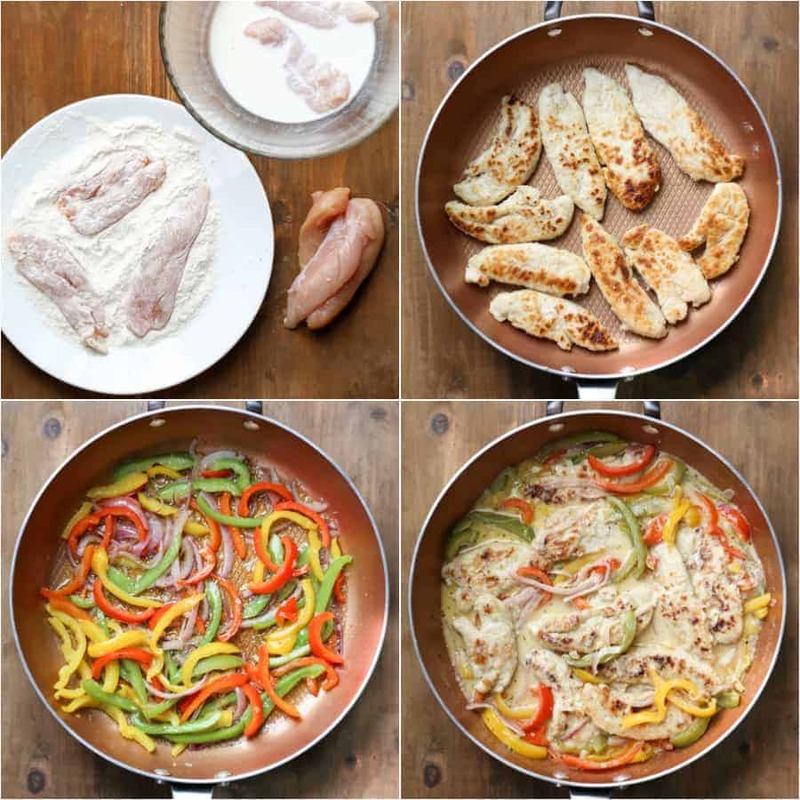 Juicy chicken tenders with vegetables in a creamy scampi sauce. The 30-minute meal. 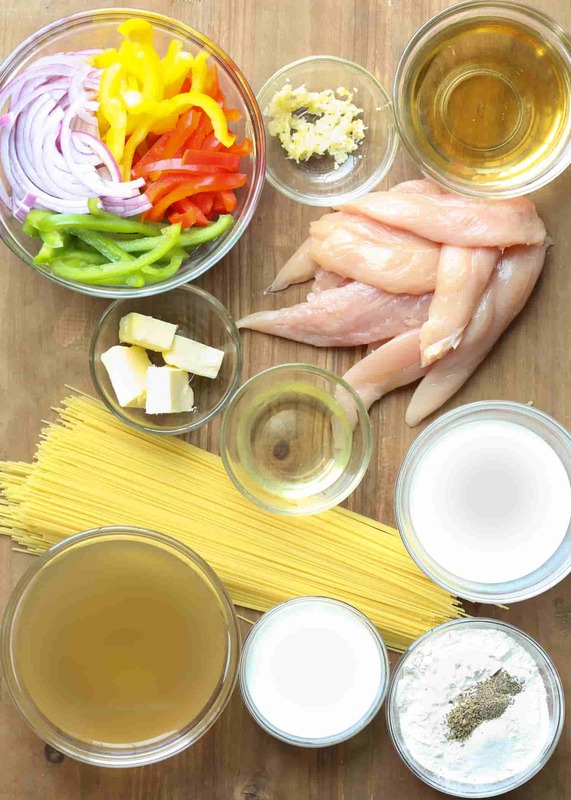 Cook angel hair pasta according to package instructions with oil and salt. Drain water and keep the pasta covered. In a large bowl, combine flour, salt, pepper and Italian seasoning for the chicken dredging. Add milk to a separate bowl. Dredge chicken tenders into flour, then into milk and again into the flour (coating generously). Heat oil in a large skillet over high heat. Once hot, saute chicken about 2 minutes on each side. Remove chicken from skillet and cover to keep warm. Add 2 Tbsp oil with the green, red, yellow peppers and red onion. Sautee 2 minutes on medium/high heat, stirring as needed. Add butter and minced garlic. Saute another minute, stirring as needed. Add the wine and broth to the vegetables. Cook on low/medium heat for 5 min. Add half and half, salt, pepper and Italian seasoning, cook another minute. Add the chicken tenders to the vegetables/sauce. Add pasta and cover with the remaining ingredients. Simmer until all of the ingredients are hot. Hello Valentina, how do you store your Chardonnay Wine (or white wine)? In the fridge for only 3-5 days? I made this last night, it was delicious even my picky eaters enjoyed this dish. Thank you for sharing this recipe, I have tried 2 other recipes and was skeptical, I too used a inexpensive Chardonnay. I loved reading your feedback, Sheila. Makes me so happy that even the picky eaters approved. 🙂 Yup, an inexpensive Chardonnay is great. Thanks for visiting our online home. Stop by again. Really is better than Olive Garden at a fraction of the price. 🙂 Winner! Thanks for trying our recipe. I can’t wait to try this. It’s my favorite dish from Olive Garden. Thanks for sharing the recipe and detailed directions. Thanks, Tina! Once you try the scampi, you’ll never want it from Olive Garden again. 🙂 Homemade is so much better! 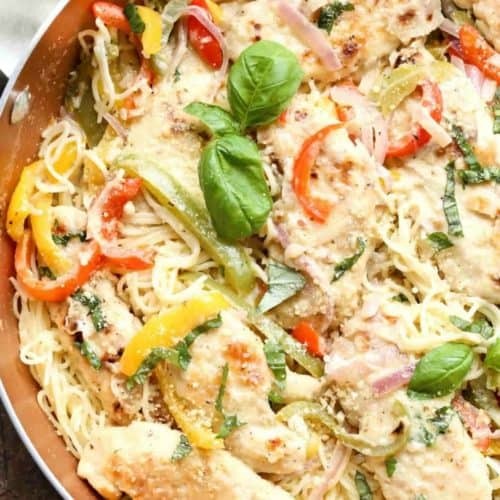 The perfect Chicken Scampi Recipe! Love this better than Olive Gardens! Thanks so much, Toria! I’m so happy you loved this better than Olive Garden, whoot, whoot! Omg I havent eaten this in sooo long. I am in heaven. I have 3 boys so going to olive garden isn’t really realistic anymore. It taste exactly like i remember. Thanks for the recipe. Hi, Marina. Maybe you missed it, there’s a part in the post that talks about which wine to use. 🙂 Hope you love the recipe. What an awesome recipe, this looks so good. I can’t wait to see more of your Olive Garden recipes in the future.